Bangalore is a key global hub of VLSI design activity with most of the leading EDA companies and top semiconductor chip design vendors having big development offices with hundreds and thousands of VLSI engineers at each office developing cutting-edge chips. When it comes to high-end chip design events in India, it was only the top 3 EDA companies Synopsys (snug), Mentor Graphics (user2user), and Cadence (CDN Live) organising events for the peers to share latest developments in semiconductor space. For 1st time, an Indian VLSI IP product company Truechip has organised a neutral event called TrueConnect 2017 on 7th Dec 2017, where engineers working in different chip design companies could assemble and present papers related to verification and other VLSI chip design areas. Along with the peers sharing the new ideas, there was also two interesting keynotes by Sanjay Gupta, Vice President and Country Manager, NXP Semiconductor, and Uday Mishra, Director, ASIC Design Engineering Management, Western Digital. Both the speakers highlighted the importance of Verification IP in the semiconductor product development for safety critical applications such as robotics and autonomous/ self driving vehicles. 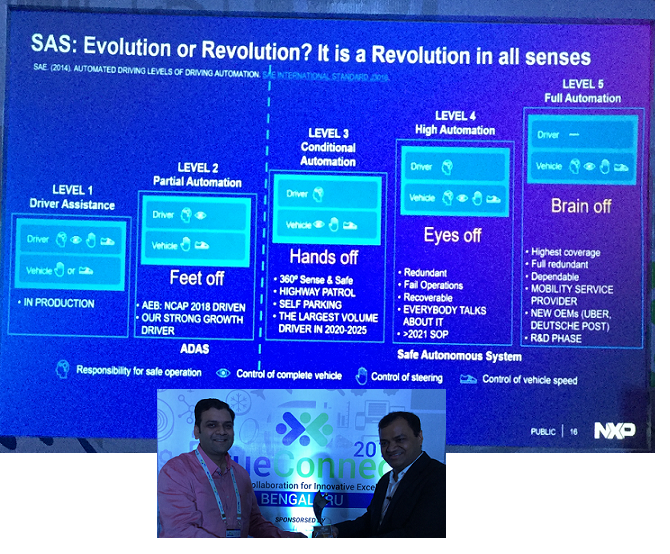 Sanjay shared to the audience how the automotive electronics industry is evolving very faster in the past 4/5 years, and it's really going very fast in terms of innovation, and market growth. With the automotive industry moving from feet-off to hands-off level in autonomous driving, and the next stage is, passengers even can take the eyes(sight) off the driving, which is expected to be happen somewhere around 2020 to 2022. Writing the code for self driving car to decide on ethical issues is one of the challenge for ADAS engineers. The 100 million lines code software in a car is getting into AI/ML/DL to enhance the processing performnace close to human being and reduce power consumption and latency. 5G is in need. Uday explained verification trends happening in the deep node 7nm chip design and the importance of verification which can ensure the safety of the car which is so dependent on semiconductor chips both in autnomous mode or otherwise. This is creating trend/market opportunity of automotive silicon IPs. Truechip offers Verification IPs for interfaces such as MIPI, PCIe, USB 3.0, DDR, HDMI, SATA, NVMe, CAN-FD and many more. The fact is, an Indian VLSI IP company competing with companies such as Synopsys and growing, tells that Truechip is offering products of high quality and value. Truechip's founder Nitin Kishore is confident of taking it to next level to sustain the growth of company's IP biz.